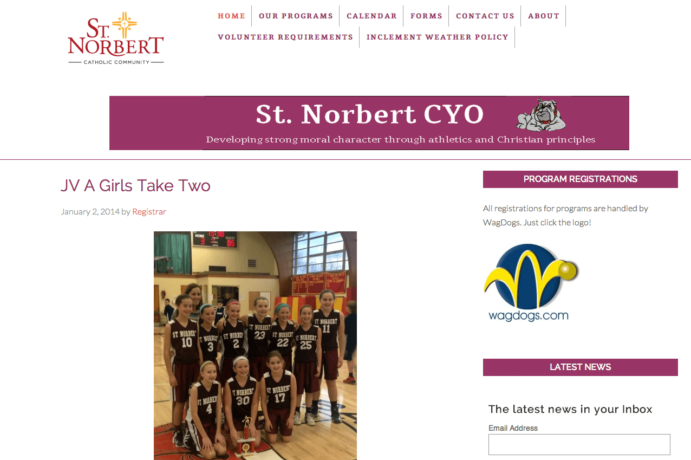 We began working with St Norbert Catholic Youth Organization (CYO) back in 2001 when they needed someone to maintain their Frontpage website. We made regular updates to content through the years and eventually converted the site Wordpress back in 2005. We would show you how it looked back then, but even the Wayback machine doesn’t have a decent snapshot from, um, way back. Throughout the years, there have been numerous updates to the site. Different looks, etc. but throughout St Norbert CYO needed a way to communicate with it’s community. During the last major update they asked Little Lauber Designs to integrate their scheduling, team signups and communications. We were able to create a look that matched the rest of the parish community websites, while keeping the original flavor geared towards the sports community. St Norbert CYO provides youth programs, mainly through athletics, to the St. Norbert Parish community. They utilize the site to make sure parents/students are aware of signups and announcements for their activities. We appreciate our time with St Norbert CYO and look forward to a long relationship. Disagree? Agree? Let us know in the comments below. Do you want to discuss this one on one, then feel free to contact us and start the conversation!